AECOsim Building Designer provides a multidisciplinary centrepiece for the creation of models for the whole workflow. It is also the point of integration for design simulation, analysis, and documentation. This BIM application enables architects and structural, mechanical, and electrical engineers to create buildings and constructions using the latest 3D engineering tools in an immersive design environment. Create with unlimited freedom and explore more design options to make better informed design decisions, and predict costs and performance, architects can easily model buildings of any form, size, and complexity. Basic working knowledge in microstation, BIM concept, and general knowledge in Architecture and Civil Engineering. Introduction to Revit MEP,MEP Interface, File Concept. Opening a Revit Project, Viewing 2D and 3D Model. Wall, Component, Roof, Ceiling and floor. Select element, Using filter, Align tool, Copy and Paste, Arrays, Extend and trim, Groups. Strating New MEP Project, Linking an Architect Revit file. Room and Room Tag, Creating Spaces, Modifying Spaces. Creating Zone, Systems Browser and Zone. Basic procedure of MEP, Mechanical Setting (Duct, Pipe), Air Terminal and Mechanical Equipment. Ducts, Duct Systems, Adding and Modifying Fittings. Cable Tray, Conduit, Parallel conduit Wires (Arc, Spline, Chamfer), Cable tray fitting, Conduit fitting. 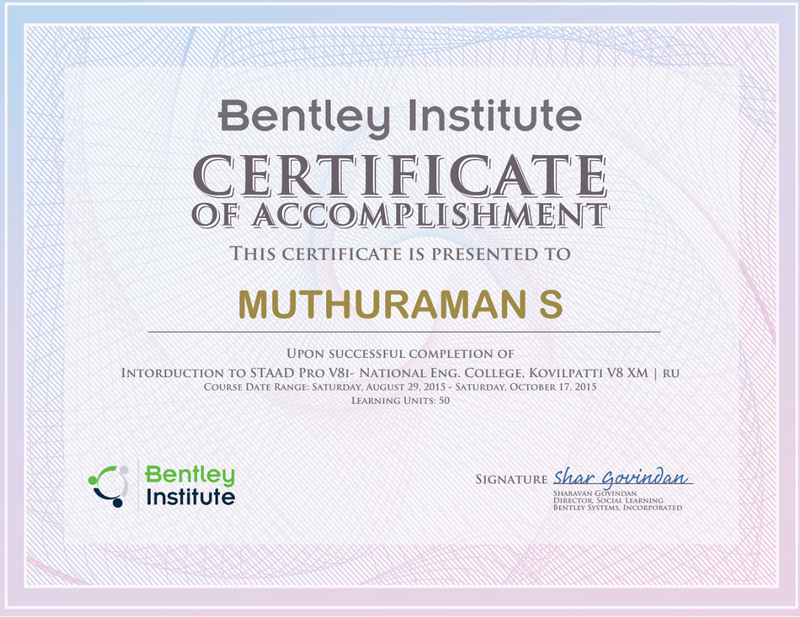 Authorized training Centre by Bentley. Know how to draw in AECOsim workspace using different drafting tools. know how to place the elements from libraries. Know how to Model Concrete structures from walls, foundations, and columns. Know how to Produce plans, framing layouts, sections, and elevations and more. You will learn to create virtually any building of any form, size, and geometric complexity. You can add floors to the model and create intelligent mass modelling.